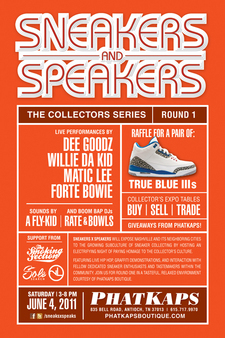 Nashville, Tennessee-May 12, 2011- Sneakers & Speakers is an event that will expose the community of Nashville to the ever growing niche culture of Sneaker collecting while infusing the elements of DJ-ing, MC-ing and Art. Sneakers & Speakers is the first major Sneaker event to take place in Nashville, Tennessee. Taking place June 4, 2011, Sneakers & Speakers is creating an aesthetic that will bring forth a strong platform for the growing sneaker culture of Nashville, Tennessee. Having taken influence from several elements, Sneakers & Speakers will present an event that blends, Sneakers, Hip Hop, Art, Breaking, DJ-ing, and networking amongst like minded individuals with similar goals and interests. The event will feature a slew of talent, from the likes of Willie The Kid, Dee Goodz, Maticlee, Forte Bowie, DJ Fly Kid, DJ Rate and DJ Bowls of the Boom Bap. These talents will be presented to fellow sneaker enthusiasts, painters, graffiti artists, bloggers, and taste makers within a controlled environment provided by Nashville’s most forward and groundbreaking Sneaker Boutique Phat Kaps. Phat Kaps has for years been a major facet to the city of Nashville. It has played destination for music artists, athletes, designers, brands and more when visiting the great city all while establishing a relationship that extends further than just being in town. “With a great tie to the community of Nashville, and the sneaker culture, Phat Kaps is undoubtedly the best destination to launch the Sneakers & Speakers series as it bridges all of the components needed to tell the story of purpose and destination.” says, Ivan Andrews coordinator for Sneakers & Speakers.